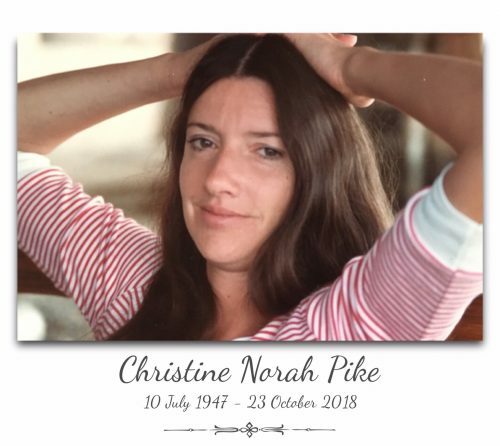 Christine Norah Pike, age 71, passed away suddenly October 23, 2018 while visiting family in BC. The family held a celebration of life in her honour in Cochrane on October 28th. Chris was born in London, England on July 10, 1947 to Sheila and Claude Clarke. She attended Thames Valley University where she met and then married her husband Roger Pike in 1969. They moved to Canada in 1970, and soon had two daughters, Sarah and Emma Pike. They shared many adventures together including building a house on Saltspring Island, travelling around Canada and abroad, having rocking parties, and moving from the west coast to the foothills of Alberta. Chris was an avid volunteer with a passion for the environment, wildlife, tai chi and was a founding member of the Cochrane Farmers’ Market. She loved the outdoors, including gardening, hiking and being surrounded by nature. Chris was an incredible mother and wife who always made time for her family and friends. Her heart was even bigger than her laugh. She is survived by her husband Roger Pike, her daughters Sarah Pike (husband Sebastien Stewart) and Emma Pike (husband Robin Staples), brother Peter Clarke (wife Valerie Clarke), and grandchildren Julien Stewart, Sadie Stewart and Peter Staples. Because Alan and I have moved to Vancouver Island, I didn’t hear the news about Chris until relatively recently, but I am so sad about this. I knew Chris through the tai chi beginners’ class, and right away I knew there was something special about her. She had such a helpful, direct way of teaching, but it was her humour that stood out, and that lovely, deep-throated laugh. She was always so open and friendly; it was easy to fall into a friendship with her and get to know her better. I really looked forward to seeing her at the tai chi sessions and sometimes be able to go for coffee with her and have a lovely chat. Both Alan and I offer our heartfelt condolences to you, Roger, and the girls, whom we have never met but about whom Chris was obviously so proud, and she often spoke of her grandchildren. Chris will be missed very much.